Utah law requires every officer to receive 40 hours of training each year. The In-Service Training Bureau provides Utah law enforcement officers this training, along with the opportunity to obtain the knowledge and skills necessary to perform their duties in a professional manner. Utah is divided into 15 training regions. Much of the training delivered in the regions and at POST is taught by qualified and enthusiastic officers from agencies throughout the state. POST’s ongoing Instructor Development classes provide individual agencies with qualified instructors. This program also provides POST with certified instructors to be used in POST sponsored training classes. The POST In-Service Training Bureau maintains a record of total training hours for officers from each law enforcement agency in the state. 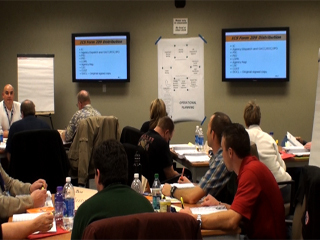 The mission of the In-Service Training Bureau is to deliver professional continuing education and training to peace officers and dispatchers in a learning environment which is conducive with the expectations of Utah citizens’ for its law enforcement officers: integrity, communication, professionalism, and alliance.